3/4s of the battle with improving the running is getting out on the road on a regular basis and making certain that your training ‘sessions’ are non-negotiable i.e. they are steadfast – others will have to learn that you work your calendar around these sessions – not the other way round. 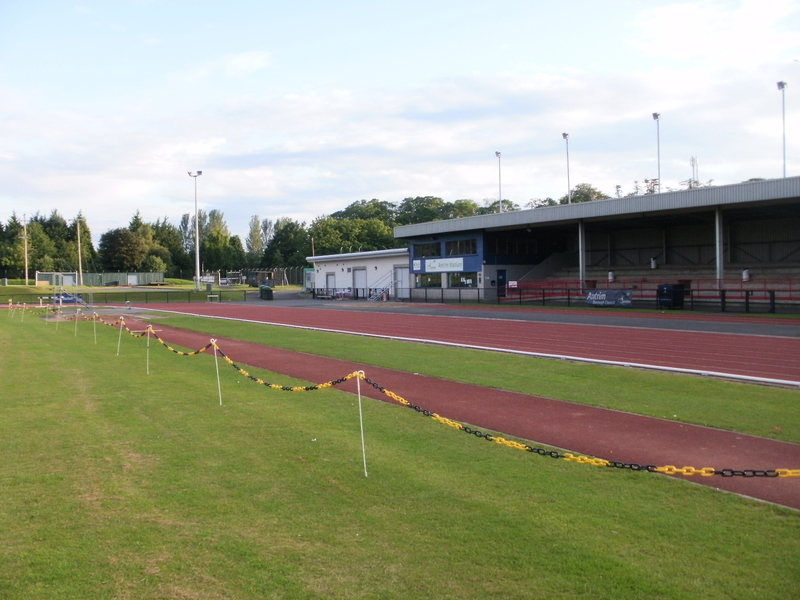 Antrim forum track. The track is a great method of gathering a few friends of mixed abilities for a really good interval session. Everyone can work at their pace yet still be in one place - no runner left behind! Most tracks aren't expensive to book for individuals when they're available. The Forum is £4 for 90mins approx. Easier said than done, but if you are training for a particular race this is what you need to do. After all, if you play football, rugby or perform other sports you will have a couple of nights fixed training sessions and a match at the weekend. You have to treat the running regime the same. I am not saying that you stick rigidly to times but simply make sure that you get your basic minimum ‘sessions’ done; allowing for recovery in between. 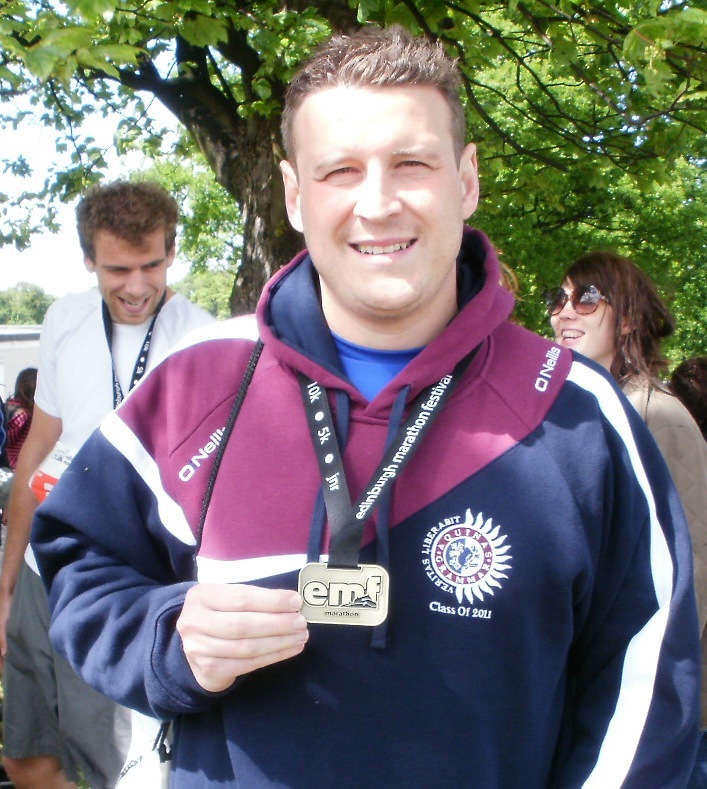 This is me having just completed my third marathon in five weeks for charity. The "Triple Marathon Challenge" was a turning point for my running exploits and gained me a lot of local press coverage both in the newspapers and local radio. These are all creative ways of getting the training in somehow, but it does require you to commit to improve – like absolutely any sport. 1. A session: This is where I work toward a specific pre-ordained goal. 2. A recovery: This is simply to keep the legs moving and I have no specific target other than to not over-exert myself. Every session should allow for a rest day or a recovery day in between. Doing consecutive sessions can lead to injury or burnout. An interval session or some sort of speed workout. A tempo or threshold run – typically 4-7miles at 20-30 seconds slower per mile than 10k pace. A long run – depending on the distance of my next race this could be from 10-20 miles. If I can squeeze in a fourth session I make it a hill run, but unless you’ve aspirations of becoming a pro you’ll not get more than four good sessions done in a week. For me the recovery runs are crucial. they stop the legs from getting stiff and I use them sometimes to stop and stretch out any tight muscles – they also help get your weekly mileage up and this is vital if you’re training for a marathon!